About two weeks ago, I spoke to Dimer (friend of the show and eCommerce Manager at AceJewelers) and he showed me his recently acquired IWC Ingenieur from their Vintage collection (as shown below). Since I have a weak spot for the Ingenieur series, I tried this Vintage Collection Ingenieur a couple of times already and am very enthusiastic about it. So it is bound to happen that there will be one in my collection at some point. Anyhows, Dimer told me that he did some research on the web about the true source of inspiration for this Vintage Collection Ingenieur. It seems like IWC is directing us towards the wrong watch in their media campaign. 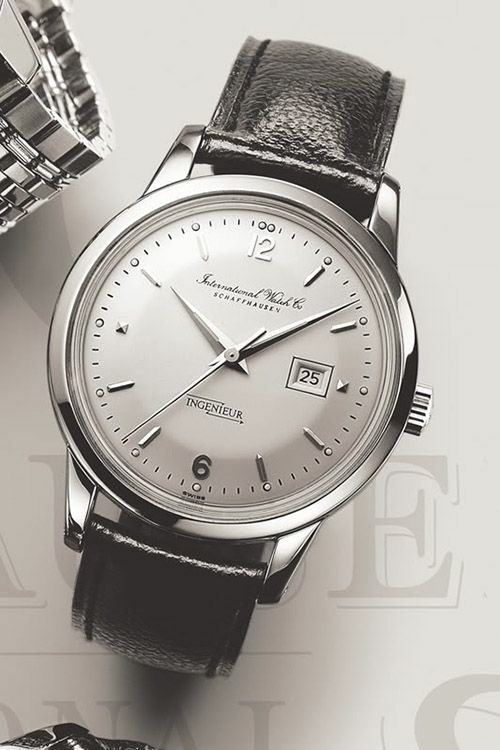 In their media campaign, IWC refers to their first line-up of Ingenieur watches in the mid-1950s. The IWC Ingenieur ref.666 AD from 1955 to be more precise, which shows us that at least they’re not very superstitious towards the use of certain combinations of numbers. The 1955 model is referring to, is shown below. This fairly large time piece – for that era – of 36.5mm had this new winding system by the name of one of their directors, Albert Pellaton. This new winding system was especially useful for watch makers, who now could simply disconnect the automatic winding system and the barrel of the watch to do repairs on the main spring or escapement, without removing the winding system in total. 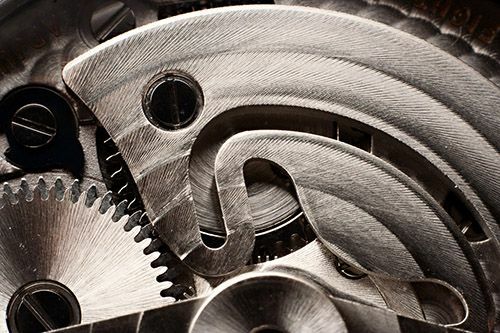 Also, the Pellaton winding system used an innovative way to make the movement as shock proof as possible, by using this flexible (winding)rotor bridge. This Pellaton winding system is still present in a number of IWC watches, including the current line-up of Ingenieur models. Below, you see a close-up of the current caliber 80110 movement that has this shock proof Pellaton winding system. In 2008, IWC introduced the Vintage Collection in order to celebrate their 140th anniversary. One of the watches in this collection was the Ingenieur as you can see in the Dimer’s excellent photograph above. As you can see, the photograph of Dimer and the vintage IWC catalogue image above do not match that well. Although the hands, case design and ‘Ingenieur’ print on the dial remind us of the vintage model, there are quite some differences to observe. What about the hour markers and metal applied frame of the date window? The color of the dial and the pie-pan shape of the vintage model are also quite different from the new Vintage Collection Ingenieur. All-in-all, a nice source of inspiration, but one can hardly speak of a replica or proper re-edition. It’s more like the current Rolex Milgauss versus the vintage Rolex Milgauss 1019 models, to name a direct competitor of a watch with a weak iron inner case. 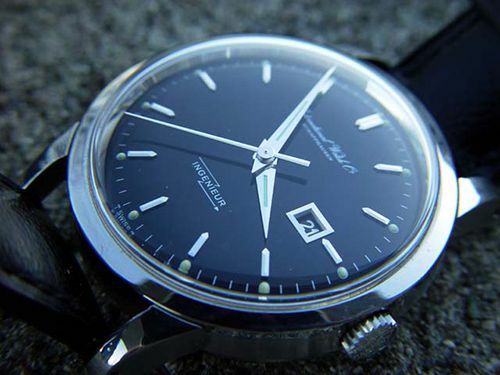 After strawling the web for more similar Ingenieur models from the years long gone, Dimer found this 1966 Ingenieur which is more like the new Vintage Collection Ingenieur. 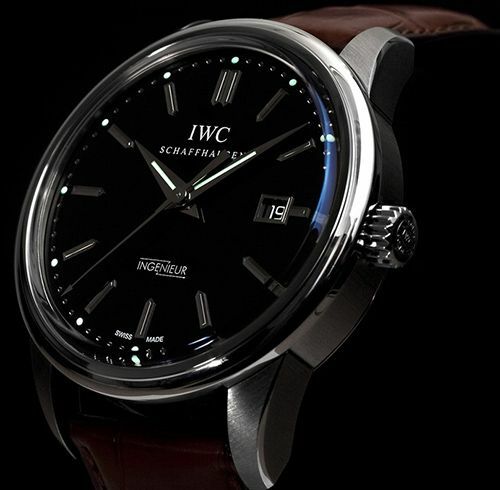 This model, with caliber 8531 movement that also includes the Pellaton winding system of course, is a much better fit and should have been used as IWC’s true source of inspiration for their 2008 novelty. Dimer did a similar write up in Dutch for the DeZinvanLuxe watch portal. I used his pictures and article as a source for this blog post. Please visit his article for some more pictures of vintage models and catalogues.